Listen to "Kris Jenner . . . And All Things Kardashian" on your iOS and Android device. I thought it would be a story of how Chris got to where she is but it was a lot of name dropping and a little bit too materialistic for me. not sure I'll finish reading it. It was fascinating to hear about what she thinks and feels ... instead of some of the silliness on the show! Skipped through on fast track. Very repetitive in parts especially consist reference about the importance of "my kids" and full of self importance. This is one narcissistic family, shallow and self absorbed. Respect for the Narrator who had to make a boring story sound interesting. Urgh, I loved it! I finished it in 2 days driving back and forth from my mum and dads place and I just couldn't stop! The only thing that would have made it better was if Kris herself was reading it! Can't wait for the next one, and lets be honest - we all know there will be one eventually! I really enjoyed this book, way more than I initially thought I would. She exposed it all which makes it very personal and profound. Great narration too! I liked most of it. The OJ Simpson trial took up a larger portion than I thought needed. 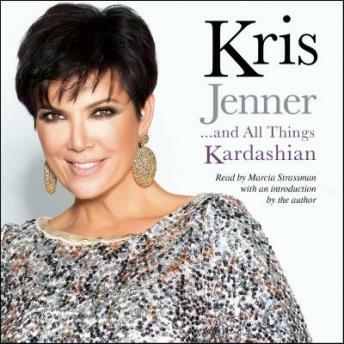 I have always been rather intrigued by the Kardashians.This is definitely a book for the fans.I felt I was giving a deeper insight into the life of a famous reality mother and there were tender emotions expressed in her story.It shared an intimate loving side of Kris Jenner .I also like the part where she talked about her friendship with Nicole and shared insight of The OJ Simpson murder.It was an enjoyable audiobook. I was very surprised by how much I enjoyed this book. I do enjoy watching the Kardashians show, but to me it always seems as though Kris puts fame and money above her family so this book gave me a different view of her. The beginning part about her childhood felt long and drawn out, but it got good once you get passed her childhood. It was interesting to hear about OJ and Nicole Simpsons relationship and then her murder from someone who was behind the scenes and very good friends with her. From there, the rest of the book stayed interesting in my opinion listening to how their fame came about and took off. Overall I thought this was a very good book for anyone who likes the Kardashians.